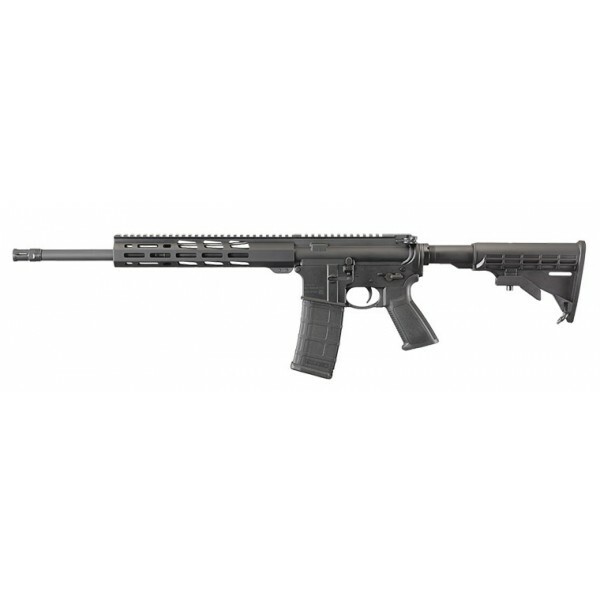 11" aluminum handguard is free-floating for accuracy and features Magpul® M-LOK® accessory attachment slots along the 3:00, 6:00 and 9:00 positions with additional slots on the angled faces near the muzzle. Flattop upper receiver features a Picatinny rail for easy attachment of magnified optic, red dot or open sights. Made from aerospace-grade 7075-T6 aluminum forging, the flattop upper receiver includes a forward assist, dust cover and brass deflector. Heavy contour, cold hammer-forged barrel with ultra-precise rifling provides exceptional accuracy, longevity and easy cleaning. The 1:8" twist rate stabilizes bullets from 35 to 77 grains, and the 5.56 NATO chamber allows the use of both 5.56 NATO and .223 Rem. ammunition. M4 feed ramps provide improved reliability, and the matte black oxide finish reduces glare and provides corrosion resistance.